[+3] - parados - 08/30/2016It would mean the homicides in Chicago are down from the 1980s and early 1990s. Was Chicago great when it's murder rate was almost double what it is now? [+3] - parados - 08/31/2016The polling doesn't show that at all. Most polls are currently showing a similar lead for Clinton with or without Johnson and Stein in the poll. We just had a woman walking home from registering her daughter for school get shot by a group of REPEATED OFFENDERS in a Detroit neighborhood. People - no matter their color - are sick of not being able to walk down the street in their own neighborhood. Homicide rate rate for black victims is less than half what it was 25 years ago. It has fallen under Clinton and Obama. How does Trump figure blacks will vote for him over this issue? He's against gun control. What does that mean? The homicide number in Chicago from Jan-Aug is now very close to 500 deaths. It used to be that folks were afraid to go out in the dark. Now in many towns and cities, people are afraid to go out....day or night. I'm for carrying a weapon for protection. But will I be ready to use a weapon, if I'm attacked? It would mean the homicides in Chicago are down from the 1980s and early 1990s. Was Chicago great when it's murder rate was almost double what it is now? Chicago is definitely experiencing a crime wave, but that is not true "in many towns and cities". 2014 and 2015 were two of the lowest murder rate years in the last four decades. 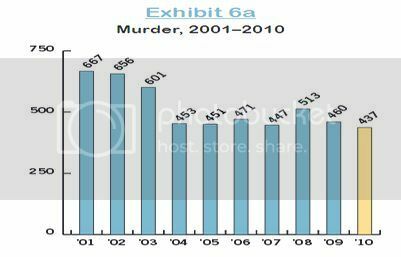 So up until this year at least, number of murders in Chicago was half of what it was before Bill Clinton took office. It's now 500 homicides from Jan, 2016 to Aug, 2016. No end in sight. With Stein and Johnson now on the ballot, the odds have shifted in favor in Trump. How will Trump change the trend of violent gang murders? Still lower murder rate than before Bill Clinton took office. The year before Clinton took office Chicago has 938 murders. Chicago won't have that this year. What polls are you reading? Johnson and Stein don't change Hillary's margin of victory. All the polls have Hillary well ahead, even counting Johnson and Stein. And Trump, who got the nomination because of his stand on immigration, is finding out that doesn't work in the November election. Johnson and Stein on Boston TV. Combine the values of Johnson+Stein and you get a value that would shift the victory to Trump, because J+S take votes away from Clinton. The polling doesn't show that at all. Most polls are currently showing a similar lead for Clinton with or without Johnson and Stein in the poll. Combine the values of Johnson+Stein and you get a value that would shift the victory to Trump, because J+S take votes away from Clinton. Don't know that is true at all, but even if I agree, how does Johnson and Stein taking votes away from Clinton change the fact that Clinton leads Trump in all the polls, even those including Johnson and Stein among the choices? Here's the Electoral Map according to the polls. 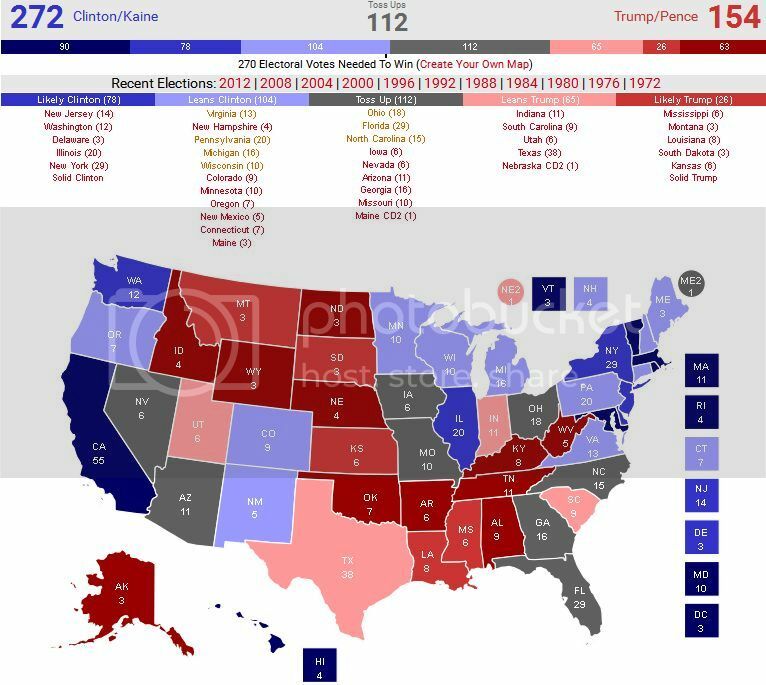 Clinton projects to over 100 Electoral votes ahead, and they are not even counting Florida-which the Democrats have won the last several times-for Hillary. You were so sure of Hillary's win... don't you feel a little bit silly now?